Were it not for the New York Yankees, Vernon Wells still would be a Los Angeles Angel, forever consigned to their dungeon of ill-fated maneuvers. Because the Yankees exist – and because they operate in a vacuum independent from their harrowing reality – the Angels now no longer must stare at a $100 million mistake for two more seasons. Desperation, thy outfit is pinstripes. The trade that would send Wells and around two-thirds of the $42 million remaining on his contract to the Yankees neared completion Sunday night, only a physical and commissioner's approval left to consummate it. Seeing as the Angels considered Wells sunk cost, the idea they would get anything, let alone savings in the parameter a source said was $12 million to $14 million, made Sunday a massive win for Los Angeles. This was not one of those win-win trades. For the Yankees, it was stunning. The steadiest franchise panicked after injuries dismantled its everyday lineup. The team that built itself on plate discipline traded for a 34-year-old outfielder who over the last two years hit .222, couldn't get on base even 26 percent of the time and, if that weren't bad enough, looks fit for Madame Tussauds in the outfield. And the offseason of Scrooge yielded to the spring of perhaps $7 million a year for Vernon Wells, who will fill in for a month or so until Curtis Granderson's return, and then … well, the Yankees seem to be thinking for tomorrow only, so who knows. "I just wonder where this money was in December," one Yankees official said. The reaction to the deal across baseball was a mix of wonderment and criticism, for to partake of Wells at this point in his career flashed alarm of which few thought the Yankees capable. Among the injuries to Granderson and Mark Teixeira, the lingering hip problems of Alex Rodriguez and the setbacks to Derek Jeter, the Yankees have endured a more brutal spring than anyone – the sort that left more than one executive on Sunday predicting a last-place finish in the American League East. However much of that is Schadenfreude, there is much more than a seed of truth to it. As writer Jason Rosenberg noted, Yankees players on the disabled list will be paid more combined than 13 teams. Teixeira's wrist injury could linger for months. A-Rod has no expected return time. Jeter's situation seems to worsen by the day. Unless the rotation and bullpen are impermeable – the latter seems possible, the former far less – the Yankees may struggle and struggle early. And in a division with three more-than-formidable rosters and a retooling Boston team, the Yankees are far from safe. Much of this, of course, was self-perpetuating. Had the Yankees not fattened their roster with aging players who have a greater predisposition to breakdown, they almost certainly wouldn't have the breadth of injury problems. Without the "War and Peace" disabled list, they wouldn't have dared go after someone with a far better name than recent track record. And they did that only because of the Yankees' ethos that demands feigning competitiveness, even if it's to the team's detriment. 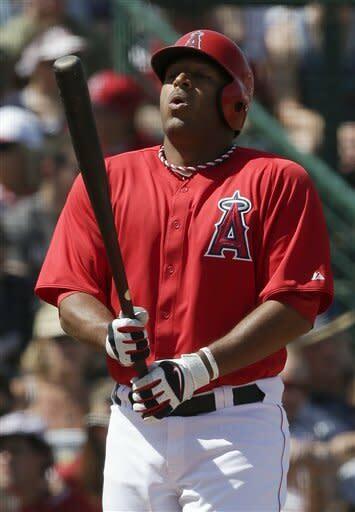 Because as two executives said late Sunday: There are better alternatives to Vernon Wells in the Yankees' system. Like Zoilo Almonte or Melky Mesa. And when there's even an argument that Almonte or Mesa, two career minor leaguers and fringe prospects, are possibly better than someone to whom you're guaranteeing upward of $14 million, there's enough cognitive dissonance to ask the question: What the hell are the Yankees doing? Even if their scouts in Arizona have told fellow scouts they felt like Wells looks better – he's got four home runs in 36 at-bats this spring – he's still a year older than he was when he lost his full-time job. Wells took the demotion with grace because he is that sort of person. Angels teammates loved him. He could have pouted and moaned and turned into a drain on the team. Instead, he was the guy who took the clubhouse attendants out to dinner as thanks for their hard work. Wells wanted to get back to who he was, too, when the Blue Jays handed him $126 million for seven seasons. He strayed from his pull-happy approach and tried to square every ball, batting practice or game, up the middle. Being Vernon Wells, mega-underachiever, didn't sit well with him either. Unless he can change his reality, none of the want-to matters. Either Wells produces for the Yankees and makes Cashman look savvy or crumbles and worsens a dismal situation. The Yankees are always dangerous, executives acknowledge, because they can spend money and have the prospects to make big trades. Problem is, bad free-agent deals and failed kids have gotten them to this point where plenty of other teams would at least consider rebuilding, even with Robinson Cano and CC Sabathia and Mariano Rivera still around. The Yankees do not rebuild. Ever. Their financial might is too great to stoop to the level of baseball's proletariat. The expectations from their fans infect how they run a ballclub. Paying Vernon Wells anything above a minimum salary, let alone more than 10 times that, doesn't compute, injuries or not, and yet the Yankees agreed to do just that Sunday. In a week, the Yankees will leave Tampa and open at home against the Red Sox. Going north will be a lineup that didn't seem to get a whole lot better Sunday, a payroll stretched even thinner and a ballclub primed for a 162-game march toward an end that hasn't looked this grim in two decades. • Ashley Judd sends out tweet in support of ... Louisville?